What do actor Dragos Bucur, TV and radio personality Andrei Gheorghe and Internet entrepreneur Cristian “Igu” Vasile have in common? Besides being men in today’s Romania, they are also among the stars of the fourth issue of Esquire Romania, an issue of firsts. 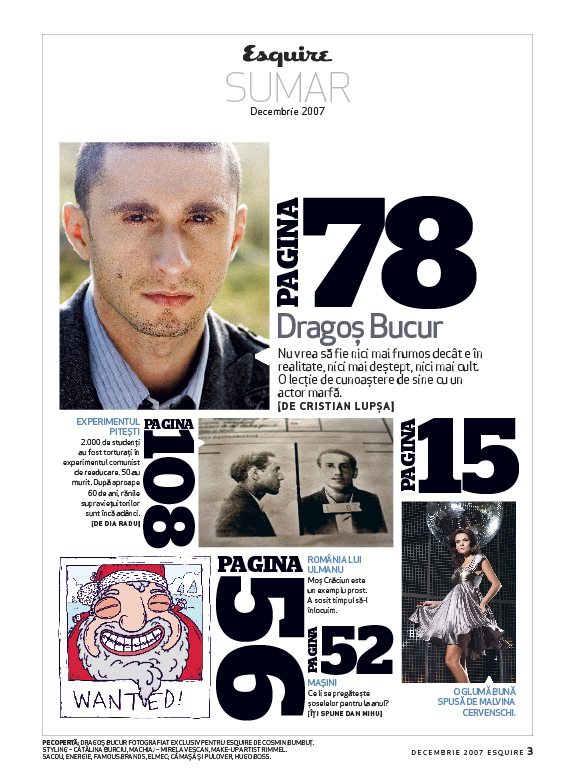 It features our first Romanian cover — graced by Dragos Bucur (see below). It clocks in at 140 pages (more than 100 of which are packed with top-notch content). It’ll be out by December 1 (first). And it has an orange spine (trust me). Esquire #4 is also my first glossy magazine cover story (the preview below is the opening spread). I always loved the first months on the staff of a newspaper – that slow progression towards getting your byline on A1. With magazines the joy isn’t as personal, but it’s still exciting. The story on Bucur is 10 pages long and it tells the story of a 30-year-old man who knows what he wants from his professional and personal life (as well as from the media). The photos were shot by Cosmin Bumbut. Below are the two pages of contents. Click the thumbnails to see the larger version. For a better and closer view at the contents, download the PDF. – and much much more (including hot drinks, the obituaries of 2007, free biblical advice, cars and the way to the elusive haircut). * Designed by the team of Raymond Bobar and Catalina Zlotea. 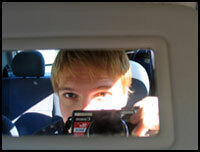 Cristian posted this entry on Thursday, November 22nd, 2007 at 4:04 pm. Posted in the category Esquire, Media, Romania	You can follow any responses to this entry through the RSS 2.0 feed. You can skip to the end and leave a response. Pinging is currently not allowed. Deea: unless it sells like mad, it should still be available Dec 15. I’m glad you’re a fan of the white background. You should e-mail us at the magazine and say that. 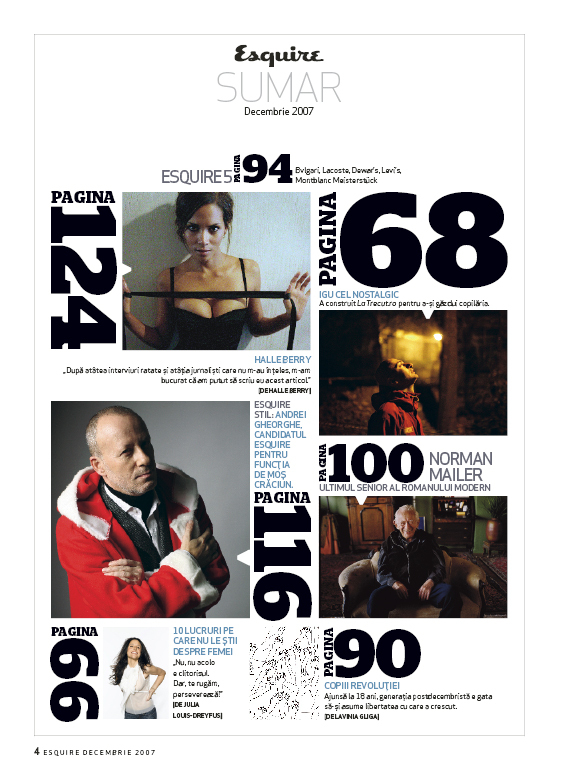 The visual people would be pleased: esquire@sanomahearst.ro. Asa sa fie! Am trimis un mail si mi-am exprimat preferinta pentru coperta cu background alb. Vrem integritate, uraa! Oh my, ignore the last one, it was just me being polite towards people that have been urging me to post in Romanian rather than English. Anyhow, I’ve sent that address an email expressing my appreciation of the white-background magazine cover. January issue had better have one! Also, you can delete my previous comment as it doesn’t look nice. Owlspotting powered by WordPress. LetoPrime theme. | Entries (RSS) and Comments (RSS).